Narita is the predominant international airport in Japan, handling around 50% of the country's international passenger traffic and 60% of its international air cargo traffic. As of 2016, Narita was the second-busiest passenger airport in Japan (after Haneda Airport in Tokyo), and was the tenth-busiest air freight hub in the world. Its 4,000-metre (13,123 ft) main runway shares the record for longest runway in Japan with the second runway at Kansai International Airport in Osaka. Narita serves as the main international hub of Japan Airlines, All Nippon Airways and Nippon Cargo Airlines, and as a hub for low-cost carriers Jetstar Japan, Peach and Vanilla Air. In 2017, Narita served 40,631,193 passengers, making it the 49th busiest airport in the world in terms of passenger traffic. Anti-airport protester's equipment and weapons. Steel tower built by protesters adjacent to Narita Airport. Prior to the opening of Narita Airport, Tokyo International Airport (Haneda Airport) was the main international airport in Japan. Haneda, located on Tokyo Bay close to densely-populated residential and industrial areas, began to suffer from capacity and noise issues in the early 1960s as jet aircraft became common. The Japanese transport ministry commissioned a study of alternative airport locations in 1963, and in 1965 selected a plan to build a five-runway airport in the village of Tomisato. The site was later moved 5 km (3.1 mi) northeast to the villages of Sanrizuka and Shibayama, where the Imperial Household had a large farming estate. This development plan was made public in 1966. The government argued that one merit of the site was the relative ease of expropriation of land. However, local residents were not consulted during the initial planning phase, and learned of the selection of the airport site through the news. This led to shock and anger among the local community, which continued for many years thereafter. Although the Japanese government possessed eminent domain power by law, such power was rarely used due to a preference to resolve land disputes consensually. At the time, the socialist movement still possessed considerable strength in Japan, evidenced by the large-scale student riots in Tokyo in 1960. Many in the "new left" such as Chukaku-ha opposed the construction of Narita Airport, reasoning that the real purpose for the new airport was to promote capitalism and to provide additional facilities for US military aircraft in the event of war with the Soviet Union. These individuals sought to ally with the more conservative local farmers who simply did not want to give up their land for the airport. Around 1966, a group of local residents combined with student activists and left-wing political parties formed a popular resistance group known as the Sanrizuka-Shibayama Union to Oppose the Airport [ja] (三里塚芝山連合空港反対同盟; Sanrizuka-Shibayama Rengo Kūkō Hantai Dōmei), which remained active until fracturing in 1983 and they started protest activity called Sanrizuka Struggle (三里塚闘争; Sanrizuka TōSō). Similar strategies had already been employed during the postwar era to block the expansion of Tachikawa Air Base and other US military facilities in Japan. In June and July 1966, the Union sent formal protests to the mayor of Narita, the governor and vice-governor of Chiba Prefecture and the prefectural office of the Liberal Democratic Party. In November 1967, when the Transport Ministry began surveying the perimeter of the airport, Union members set up roadblocks. The Zengakuren radical student union then began sending students to Narita to help the local farmers. During Eminent domain, three policemen were killed by activists (ja:成田空港予定地の代執行;ja:東峰十字路事件). Takenaka Corporation constructed the first terminal building, which was completed in 1972. The first runway took several more years due to constant fights with the Union and sympathizers, who occupied several pieces of land necessary to complete the runway and temporarily built large towers in the runway's path. In 1977, the government had finally destroyed the towers, but 1 activist and 1 policeman were killed (ja:東山事件; ja:芝山町長宅前臨時派出所襲撃事件). The runway was completed and the airport scheduled to open on March 30, 1978, but this plan was disrupted when, on March 26, 1978, a group of protestors broke into the control tower and destroyed much of its equipment, causing about $500,000 in damage and delaying the opening until May 20（ja:成田空港管制塔占拠事件）. The airport opened under a high level of security; the airfield was surrounded by opaque metal fencing and overlooked by guard towers staffed with riot police. 14,000 security police were present at the airport's opening and were met by 6,000 protesters; a Japanese newscaster remarked at the time that "Narita resembles nothing so much as Saigon Airport during the Vietnam War." Protestors attacked police on the opening day with rocks and firebombs while police responded with water cannons; on the other side of Tokyo, a separate group of protestors claimed responsibility for cutting the power supply to an air traffic control facility at Tokorozawa, which shut down most air traffic in the Tokyo area for several hours. The National Diet passed a special statute, the Emergency Measures Act Relating to the Preservation of Security at New Tokyo International Airport [ja], specifically banning the construction and use of buildings for violent and coercive purposes relating to the new airport. 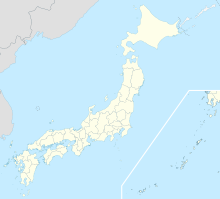 Nevertheless, several people have been killed by terrorism, including in arson incidents against Totetsu Kogyo and Nippi Corp. employees in 1983 and 1990, respectively, as well as an attack on a Chiba Prefecture official in 1988. The conflicts at Narita were a major factor in the decision to build Kansai International Airport in Osaka offshore on reclaimed land, instead of again trying to expropriate land in heavily populated areas. Japan's international flag carrier, Japan Airlines moved its main international hub from Haneda to Narita, and Northwest and Pan American also moved their Asian regional hubs from Haneda to Narita. Pan American transferred its Pacific Division, including its Narita hub, to United Airlines in February 1986. Japanese domestic carrier All Nippon Airways began scheduled international flights from Narita to Guam in 1986. From 1978 to 2015, Narita Airport was the only airport in Japan where visitors were required to show ID upon entry, due to the tumultuous history of the airport's construction and the violent protests before, during, and after its opening. By 2012, Narita's operator was considering dispensing with the security checks. Given that the number of flight slots at Narita are also increasing, the anti-airport struggles were a long time ago, and Haneda Airport began to re-instate international flights, a council headed by Chiba governor Kensaku Morita consisting of prefectural government officials, the Narita International Airport Corporation and business groups in Narita, proposed scrapping the ID checks. The Chiba prefectural police objected, stating that the checks were necessary to detect extremists and terrorists. NAA experimented with a new threat detection system for two months in 2013, using a combination of cameras, explosive detectors, dogs and other measures in lieu of passport and baggage checks upon entering the terminal. In March 2015, NAA announced that the ID checks would cease and the new system would be used for terminal building security, effective as of the end of that month. Narita Airport was the first Japanese airport to house millimeter wave scanners. The Ministry of Land, Infrastructure and Transport announced in March 2010 that trials would be carried out at Narita from July 5 through September 10, 2010. Five types of machines were to be tested sequentially outside the Terminal 1 South Wing security checkpoint; the subjects were Japanese nationals who volunteered for trial screening, as well as airport security staff during hours when the checkpoint is closed. New Tokyo International Airport was originally envisioned to have five runways, but the initial protests in 1965 led to a down-scaling of the plan to three runways: two parallel northwest/southeast runways 4,000 m (13,123 ft) in length and an intersecting northeast/southwest runway 3,200 m (10,499 ft) in length. Upon the airport's opening in 1978, only one of the parallel runways was completed (16R/34L, also known as "Runway A"); the other two runways were delayed to avoid aggravating the already tense situation surrounding the airport. The original plan also called for a high-speed rail line, the Narita Shinkansen, to connect the airport to central Tokyo, but this project was also cancelled with only some of the necessary land obtained. By 1986, the strengthening Japanese yen was causing a surge of foreign business and leisure travel from Japan, which made Narita's capacity shortage more apparent. However, eight families continued to own slightly less than 53 acres (21 ha) of land on the site which would need to be expropriated in order to complete the other two runways. Although the government could legally force a sale of the land, it elected not to do so "because of fears of more violence." By 1991, Narita was handling 22 million passengers a year, despite only having a design capacity of 13 million. On November 26, 1986, the airport authority began work on Phase II, a new terminal and runway north of the airport's original main runway. To avoid the problems that plagued the first phase, the Minister of Transport promised in 1991 that the expansion would not involve expropriation. Residents in surrounding regions were compensated for the increased noise-pollution with home upgrades and soundproofing. Terminal 2 opened on December 4, 1992, at a cost of $1.36 billion. The new terminal had approximately 1.5 times the space of the older terminal, but its anti-congestion benefits were delayed because of the need to close and renovate much of the older terminal. The airport's land situation also meant that the taxiway to the new terminal was one-way for much of its length, and that taxi times between the terminal and runway were up to 30 minutes. The B runway (16L/34R) opened on April 17, 2002, in time for the World Cup events held in Korea and Japan that year. However, its final length of 2,180 m (7,152 ft), much shorter than its original plan length of 2,500 m (8,202 ft), left it too short to accommodate Boeing 747s. The runway was further impeded by a three-story concrete building in the path of its taxiway, which the Union had constructed in 1966, forcing the taxiway to bend inward toward the runway. This imposed restrictions on the number of aircraft that could use the runway, since it was impossible for an aircraft to safely pass through the curve in the taxiway while another aircraft was using the runway. Runway B's limitations were made particularly apparent following the 2009 crash of FedEx Express Flight 80, which shut down Runway A and forced some heavy aircraft to divert to other airports. The runway was extended northward to 2,500 metres (8,202 ft) on October 22, 2009, allowing an additional 20,000 flights per year. In 2008, the Supreme Court of Japan ruled in favor of the airport authority regarding ownership of Union-occupied land in the path of the taxiway, allowing the taxiway to be modified to provide enough room for safe passing. The building remained in place until August 2011, when authorities removed it under a court order; 500 police officers were dispatched to provide security for the operation while 30 airport opponents protested. Beginning on October 20, 2011, the airport was approved to allow simultaneous landings and take-offs from the A and B runways. The approval allowed the airport to increase annual take offs from 220,000 to 235,000 and increase hourly departure capacity from 32 to 46. The parallel runways are 2.5 km (1.6 mi) apart. A further extension of the B runway to 3,500 m has been under official consideration since 2014, but would require the acquisition of a property to the south of the runway owned by fifteen protesters, only one of whom has indicated an intention to sell as of May 2015. Under the airport's master plan, the third "C runway" would be a 3,200 metres (10,499 ft) cross runway south of the passenger terminals. Although NAA controls most of the property needed for its construction, certain small portions remain blocked by small plots of land held by airport protestors, and portions near the South Wing of Terminal 1 are currently used for aircraft parking. Use of the runway would also require noise abatement negotiations with the municipalities to the northeast and southwest of the airport, including the city of Yachimata which would lie directly beneath the southbound flight path from the runway. Due to these issues, the construction of the C runway has been put on hold indefinitely. Terminal 3, a LCC terminal, opened on April 8, 2015. It is located north of Terminal 2, where a cargo building used to sit, and has a capacity of 50,000 flights per year. The new terminal does not have boarding bridges to save cost; passengers will use boarding ramps instead. Taisei Corporation was awarded a ¥11.2 billion contract to build the terminal in January 2013. The airport also constructed a new LCC apron to the north of the terminal, with five additional parking slots for Airbus A320 and similarly-sized aircraft. Railway routes between Tokyo and NRT. Narita Express of JR East is in gray. New Skyliner route is in purple. The Keisei Main Line is in green. Since its construction, Narita has been criticized for its distance from central Tokyo, with journeys taking an hour by the fastest train and often longer by road due to traffic jams. Narita's distance is even more problematic for residents and businesses in west Tokyo and Kanagawa Prefecture, both of which are much closer to Tokyo International Airport (Haneda Airport). Through the end of the 1980s, Narita Airport's train station was located fairly far from the terminal, and passengers faced either a long walk or a bus ride (at an additional charge and subject to random security screenings). Transport Minister Shintaro Ishihara, who later served as governor of Tokyo, pressed airport train operators JR East and Keisei Electric Railway to connect their lines directly to the airport's terminals, and opened up the underground station that would have accommodated the Shinkansen for regular train service. Direct train service to Terminal 1 began on March 19, 1991, and the old Narita Airport Station was renamed Higashi-Narita Station. The Narita Rapid Railway opened on July 17, 2010 and shaved 20 minutes off the travel time. The line's new Skyliner express trains with a maximum speed of 160 km/h (99 mph) are scheduled between Tokyo's Nippori Station and Narita Airport Terminal 2·3 Station in 36 minutes, which compares favourably with other major airports worldwide. A new expressway, the North Chiba Road, is also under construction along the Narita Rapid Railway corridor. Improvements such as the Wangan Expressway also shaved off travel time to Kanagawa Prefecture by bypassing Tokyo. The Japanese government has also invested in several local infrastructure projects in order to address the demands of airport neighbors. The largest of these is the Shibayama Railway, a short railway connection between the Keisei Main Line and the area immediately east of Narita Airport. This line opened in 2002 with government and NAA support after extensive demands from Shibayama residents, and provides a direct rail link from Shibayama to Narita City, Chiba City and central Tokyo. Another such project is the Museum of Aeronautical Sciences in Shibayama Town, which draws tourists and student groups to the area. In 2003, a Narita International Airport Corporation Act (成田国際空港株式会社法) was passed to provide for the privatization of the airport. As part of this change, on April 1, 2004, New Tokyo International Airport was officially renamed Narita International Airport, reflecting its popular designation since its opening. The airport was also moved from government control to the authority of a new Narita International Airport Corporation. NAA announced a major expansion of the airport in March 2018. The expansion will include a third "C runway" on the east side of the airport, to be completed by 2028. The new runway will increase the airport's annual slot capacity from 300,000 to 460,000. The B runway will also be extended, and the airport's operating hours will be extended to cover the period between 5 a.m. and 12:30 a.m. Local authorities agreed to the expansion plan after an 18-month process due to the need for further local revitalization. Terminal 1 uses a satellite terminal design divided into a North Wing (北ウイング, kita-uingu), Central Building (chūō-biru), and a South Wing. Two circular satellites, Satellites 1 (gates 11–18) and 2 (gates 21–24), are connected to the North Wing. Satellites 3 and 4 (gates 26–38 and gates 41-47) compose a linear concourse connected to the Central Building. Satellite 5 (gates 51-58) is connected to the South Wing. Check-in is processed on the fourth floor, and departures and immigration control are on the third floor. Arriving passengers clear immigration on the second floor, then claim their baggage and clear customs on the first floor. Most shops and restaurants are located on the fourth floor of the Central Building. The South Wing includes a duty-free mall called "Narita Nakamise", one of the largest airport duty-free brand boutique mall in Japan. Japan Airlines used Terminal 1 prior to joining oneworld. The North Wing has served as an alliance hub for SkyTeam since 2007, when Delta Air Lines and Aeroflot joined Air France, KLM, Aeromexico, Korean Air and other SkyTeam carriers already operating there. As of 2016, Aircalin, Hawaiian Airlines, Jin Air, and Etihad Airways are the only scheduled non-SkyTeam carriers operating from the North Wing. The South Wing and Satellite 5 opened in June 2006 as a terminal for Star Alliance carriers. The construction of the South Wing took nearly a decade and more than doubled the floor area of Terminal 1 to a total of 440,000 square meters. Today, all Star Alliance members use this wing, along with non-members Air Busan, MIAT, Uzbekistan Airways. Terminal 2 is divided into a main building (honkan) and satellite, both of which are designed around linear concourses. The two were connected by the Terminal 2 Shuttle System, which was designed by Japan Otis Elevator and was the first cable-driven people mover in Japan. A new walkway between the main and satellite buildings began operation on September 27, 2013, and the shuttle system was discontinued. Terminal 2 can handle large aircraft like the A380 (operated by Emirates) and Boeing 747-8. Terminal 2 includes a duty-free mall called "Narita 5th Avenue [ja]", the largest duty-free mall in Japan. For domestic flights, three gates (65, 66, and 67) in the main building are connected to both the main departures concourse and to a separate domestic check-in facility. Passengers connecting between domestic and international flights must exit the gate area, walk to the other check-in area, and then check in for their connecting flight. Japan Airlines is currently the main operator in T2. The terminal has served as a hub for all oneworld alliance carriers at NRT since 2010, when British Airways moved from Terminal 1. Several other airlines also use the terminal, including SkyTeam carriers China Airlines and China Eastern Airlines, as well as Star Alliance carrier Air India, Oneworld connect partner Fiji Airways, and non-affiliated carriers Air Macau, Air Niugini, Eastar Jet, Emirates, Pakistan International Airlines, Philippine Airlines and Scoot. Vanilla Air, a low cost carrier, has its headquarters within Terminal 2 but operates from Terminal 3. All Nippon Airways and several other Star Alliance carriers used Terminal 2 prior to the opening of the Terminal 1 South Wing in 2006. A third terminal for low-cost carriers opened on April 8, 2015. Located 500 m north of Terminal 2, the new terminal incorporates several cost-cutting measures, including using decals instead of lighted directional signs and using outdoor gates and airstairs instead of jet bridges, which are intended to reduce facility costs for airlines and their passengers by around 40% on international flights and 15% on domestic flights. Jetstar Japan, Vanilla Air and three other low-cost carriers use the terminal. The terminal also includes a 24-hour food court, which is the largest airport food court in Japan, and a multi faith prayer room. It was built at a cost of 15 billion yen and covers 66,000 square meters of floor space. Narita Airport Authority's headquarters is on the airport grounds. The authority previously had its head office in Tokyo with some offices in and around Nairta; the head office moved and the Narita offices consolidated according to the decision by the Japanese Cabinet in July 1988 making it a special corporation. The NAA head office started operations at the airport on July 1, 1996, in the former Japan Airlines operations center, acquired by NAA in July 1994. Renovations occurred from September 1995 to March 1996. After the move, the Kishimoto Building in Marunouchi, Chiyoda, Tokyo housed the NAA's Tokyo functions. Nippon Cargo Airlines (NCA) has its headquarters on the grounds of Narita Airport, in the NCA Line Maintenance Hangar (NCAライン整備ハンガー, NCA Rain Seibi Hangā). Previously NCA had its headquarters on the fourth floor of the Cargo Administration Building (貨物管理ビル, Kamotsu Kanri Biru)). Japan Airlines operates the Japan Airlines Narita Operation Center (日本航空成田オペレーションセンター, Nihon Kōkū Narita Operēshon Sentā) at Narita Airport. The subsidiary airline JALways once had its headquarters in the building. 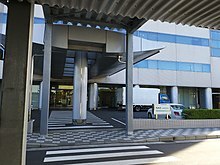 All Nippon Airways also has a dedicated "Sky Center" operations building adjacent to Terminal 1, which serves as the headquarters of ANA Air Service Tokyo, a ground handling provider which is a joint venture between ANA and the airport authority. The Museum of Aeronautical Science is located on the south side of Narita Airport and has a number of aircraft on exhibit, including a NAMC YS-11 and a number of small piston aircraft. 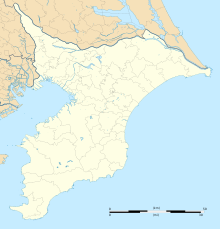 The airport is connected by a 47 km (29 mi) pipeline to the port of Chiba City and to a fuel terminal in Yotsukaido. The pipeline opened in 1983, and had pumped 130 billion liters of fuel to Narita Airport by its thirtieth anniversary of operations in 2013. To assist in the relationship with the local community, NAA operates the Community Consultation Center (地域相談センター) and the Airport Information Center (空港情報センター). The Community Consultation Center is in the Chiyoda Branch of Shibayama-machi Community Center in Osato, Shibayama, while the Airport Information Center is located in Sanrizuka, Narita. Komaino Junction outside Narita Airport. The tunnel to the left leads to the airport terminal stations; the tunnel to the right leads to Higashi-Narita Station and the Shibayama Railway. Narita Airport has two rail connections, with airport express trains as well as commuter trains running on various routes to Tokyo and beyond. Two operators serve the airport: East Japan Railway Company (JR East), and Keisei Electric Railway. Trains to and from the airport stop at Narita Airport Terminal 1 Station in Terminal 1 and Narita Airport Terminal 2·3 Station in Terminal 2. Narita Express runs from the airport via the Narita and Sōbu lines to Tokyo Station. The trainsets divide at Tokyo, with one set looping clockwise around central Tokyo to the Shōnan–Shinjuku Line, stopping at Shibuya, Shinjuku, Ikebukuro, Ōmiya and/or Takao, while the other set proceeds south to Shinagawa, Yokohama and Ōfuna through the Yokosuka Line. Trains normally run non-stop between Narita Airport and Tokyo, but during rush hours they also stop at Narita, Sakura, Yotsukaidō and Chiba to accommodate commuters. The daytime non-stop service takes 55 min from the airport to Tokyo. A single trip from the airport to Tokyo Station costs ¥3,020, while a trip to more distant stops costs up to ¥4,620. All seating is reserved. A rapid service train is the suburban JR service to the airport. It follows the same route to Tokyo Station but makes 15 intermediate stops en route, taking 80 min as opposed to the non-stop 55-min Narita Express. From Tokyo Station, most trains continue through the Yokosuka Line to Ōfuna, Zushi, Yokosuka and Kurihama in Kanagawa Prefecture. A single trip to Tokyo Station on this route costs ¥1,320. "Green Car" (first class) seats are available on both trains for an additional surcharge. Keisei operates two lines between Narita Airport and central Tokyo. The newer Keisei Narita Airport Line follows an almost straight path across northern Chiba Prefecture, while the older Keisei Main Line passes through the cities of Narita, Sakura and Funabashi. The lines converge at Keisei-Takasago Station in northeast Tokyo and then follow a common right-of-way to Nippori Station and Keisei Ueno Station, both located on the northeast side of the Yamanote Line that loops around central Tokyo. Keisei operates a number of trains between the airport and Tokyo: Skyliner is the fastest train between the airport and the Yamanote Line. Travel time is 36 min to Nippori and 41 min to Keisei Ueno. Tokyo Station can be reached in 50 min with a transfer to the Yamanote Line. A single trip from the airport to Nippori Station costs ¥2,470. Morningliner and Eveningliner trains respectively operate toward Tokyo in the morning and away from Tokyo in the evening, and make intermediate stops at Keisei Narita, Keisei Sakura, Yachiyodai, Keisei Funabashi and Aoto to accommodate commuters. A single trip to Nippori Station on this route costs ¥1,440. Access Express suburban trains run through the Narita Sky Access Line but with intermediate stops en route. A single trip from the airport to Nihombashi Station (on the Toei Asakusa Line) costs ¥1,330. Most Access Express trains run to Haneda Airport via the Toei Asakusa Line and Keikyu Main Line before 5pm, while after that most services run to Nippori and Keisei Ueno. Limited Express suburban trains run through the Keisei Main Line. These are the cheapest and slowest trains between Narita and central Tokyo, reaching Nippori in 70-75 min and Keisei Ueno in 75-80 min. A single trip to Nippori Station on this route costs ¥1,030. All seats are reserved on the express "Liner" services, while the suburban "Express" services use open seating. There are regular bus (limousine) services to the Tokyo City Air Terminal in 55 minutes, and major hotels and railway stations in the Greater Tokyo Area in 35–120 minutes. These are often slower than the trains because of traffic jams. The chief operator of these services is Airport Transport Service under the "Friendly Airport Limousine" brand. Other operators include Keisei Bus, Chiba Kotsu and Narita Kuko Kotsu. There is also an overnight bus service to Kyoto and Osaka. Buses also travel to nearby US military bases, including Yokosuka Navy Base and Yokota Air Base. Fixed rate taxi service to Tokyo, Kawasaki, Yokohama, Yokosuka, Miura is available. 14,000 yen – 40,300 yen (expressway tolls 2,250 yen – 2,850 yen are not included in the fixed fare, and need to be paid as a surcharge). Operated by Narita International Airport Taxi Council Members. The main road link to Narita Airport which connects to the Shuto Expressway network at Ichikawa, Chiba. Mori Building City Air Service offered a helicopter charter service between Narita and the Ark Hills complex in Roppongi, taking 35 minute and costing 280,000 yen each way for up to five passengers, however the service was discontinued on December 1, 2015. Haneda Airport is approximately 1.5–2 hours from Narita Airport by rail or bus. By rail, the Keisei Electric Railway runs direct trains between Narita and Haneda in 101 minutes for ¥1740 as of May 2012. The Tokyo Monorail runs from Haneda to Hamamatsuchō Station in 15–20 minutes. A short transfer to Japan Railway train to Tōkyō Station is required to connect to the Narita Express train to Narita airport. There are also direct buses between the airports operated by Airport Limousine Bus. The journey takes 65–85 minutes or longer depending on traffic and cost ¥3000 as of May 2012. 1980: When Paul McCartney arrived at Narita International Airport, he was arrested for cannabis possession. He was jailed for nine days and then deported. He was not able to enter Japan for the next ten years. 1985: On June 22, a piece of luggage exploded while being transferred to Air India Flight 301, killing two baggage handlers. The luggage had originated at Vancouver International Airport. Fifty-five minutes later, another piece of luggage, also originating from Vancouver, exploded on Air India Flight 182, killing all on board. In the late 1980s, the Union to Oppose the Airport constructed two steel towers, 30.8 metres (101 ft) and 62.3 metres (204 ft) respectively, blocking the northbound approach path to the main runway. In January 1990, the Chiba District Court ordered the towers dismantled without compensation to the Union; the Supreme Court of Japan upheld this verdict as constitutional in 1993. 1987: Chukaku-ha, a radical organization, carried out a simultaneous overnight bombing of the offices of five companies in the Greater Tokyo Area involved in the Phase II expansion of Narita Airport. 1997: United Airlines Flight 826 experienced severe turbulence after leaving Narita en route for Honolulu. Due to injuries sustained by passengers, the aircraft made an emergency landing at Narita. One woman on the flight died of her injuries. 2003: January 27: All Nippon Airways Flight 908 (operated by Air Japan), a Boeing 767 aircraft arriving from Incheon International Airport, South Korea, overshot on Runway 16L/34R after landing. The runway was closed overnight due to necessary investigations and repairs. This was the first such incident of overrunning at Narita and an overnight closing to occur at the airport since its opening in 1978. 2004: On July 13, Bobby Fischer was detained at Narita Airport for using an invalid U.S. passport while trying to board a Japan Airlines flight to Manila. He left Japan a year later after obtaining asylum in Iceland. 2009: On March 23, FedEx Express Flight 80, a MD-11 aircraft from Guangzhou Baiyun International Airport, China, crashed on Runway 16R/34L during landing, killing both the pilot and co-pilot. Runway 16R/34L, which is required for long-distance flights and heavier aircraft, was closed for a full day due to necessary investigations, repairs and removal of wreckage. This was the first fatal airplane crash to occur at the airport since its opening in 1978. At Narita, simultaneous landing is performed to process busy traffic. Here, an ANA Boeing 767-300ER is landing on the closer runway while a Skymark Airlines Boeing 737-800 lands in the background. Complaints over slots and landing fees have plagued the busy airport. Because so many airlines want to use it, the Japanese aviation authorities extend use time for Narita International Airport until midnight, and cut cost by denationalization. In 2004, New Tokyo International Airport Authority (NAA) was privatized and turned into Narita International Airport Corporation (NAA). Narita's landing fees were once more than double of those of Incheon International Airport (¥195,000 in November 2012), Singapore Changi Airport, and Shanghai Pudong Airport (¥170,000 in November 2012). In 2014, the policy of Open skies was implemented. Airlines can increase or decrease the number of its flights freely, and Narita's landing fees was cut by up to 50%. In October 2010, Narita announced plans to build a new terminal for low-cost carriers (LCCs) and to offer reduced landing fees for new airline service, in an attempt to maintain its competitiveness against Haneda Airport. In July 2011, ANA and AirAsia announced that they would form a low-cost carrier subsidiary, AirAsia Japan, based at Narita. Later in 2011, JAL and Jetstar Asia announced a similar low-cost joint venture, Jetstar Japan, to be based at Narita. Skymark Airlines opened a domestic base at Narita in November 2011, and by February 2012 was operating 70 departures per week from NRT. Skymark cited the lower fees at NRT as a key reason for this move. Spring Airlines Japan, an LCC partly owned by Spring Airlines, plans to begin service in 2014 with NRT as its primary base. Narita's restricted hours, congestion and landing fees have caused difficulties for LCCs operating at the airport. On Jetstar Japan's first day of operations in July 2012, a departing flight was delayed on the tarmac for one hour, forcing a cancellation. Less than two weeks later, a departing Jetstar Japan flight from Narita to New Chitose Airport was significantly delayed such that the return flight to Narita using the same aircraft could not arrive before the 11 PM curfew, forcing another cancellation. LCCs at Narita currently use the corner of Terminal 2 which is farthest from Runway A, often requiring a long taxi time. ^ a b For 2006 to 2015: 暦年・年度別空港管理状況調書 [Yearly airport management statistics report] (PDF) (in Japanese). Ministry of Land, Infrastructure, Transport and Tourism. 17 August 2016. p. 1. Archived from the original (PDF) on 21 October 2016. Retrieved 13 October 2016. ^ "Location". Narita International Airport Corporation. Archived from the original on 2 December 2014. Retrieved 15 May 2015. ^ "Narita International Airport". Japan Civil Aviation Bureau. Retrieved 15 May 2015. ^ "Annual Traffic Data > Cargo > 2013 final". ACI. Retrieved 15 May 2015. ^ "Narita and Haneda: Two Airports in the Tokyo Metropolitan Area". Japan Aerospace Exploration Agency. Retrieved 15 May 2015. ^ "Evolution of Metropolitan Airports in Japan" (PDF). OECD International Transport Forum Discussion Paper No. 2013-3: 10–14. February 2013. Archived from the original (PDF) on 2016-03-05. Retrieved 15 May 2015. ^ Lum, Marissa L.L. (2007). "Analysis of Eminent Domain in Japan and America" (PDF). Asian-Pacific Law and Policy Journal. 8 (2): 459–464. Retrieved 15 May 2015. ^ a b Fighting Rages over Tokyo Airport, Nashua Telegraph, May 20, 1978. ^ See the Japanese Wikipedia article on this incident]]. ^ Japan: Open But Still Embattled, TIME, June 5, 1978. ^ Japan to Open Costly But Convenient Airport, New York Times, August 21, 1994. ^ "Unknown" (PDF). Archived from the original (PDF) on 2011-06-07. Retrieved 2010-07-08. ^ Narita Journal; An Airport Is Being Strangled by Relentless Foes, New York Times, September 26, 1989. ^ a b Brull, Steven. New $1.36 Billion Terminal Is No Cure-All: Tokyo's Troubled Airport, New York Times, December 3, 1992. ^ "Second Passenger Terminal Opened on December 4, 1992." Narita Airport. September 1, 2000. Retrieved on January 7, 2019. ^ Japan opens second runway ahead of World Cup finals, ABC News, April 17, 2002. ^ ; Kyodo News, "Runway extension at Narita finally opens", Japan Times, October 23, 2009. ^ Narita airport — worth long struggle to build?, The Japan Times, June 9, 2009. ^ Kyodo News, "Narita's second runway marks 10 contentious years", Japan Times, 24 April 2012, p. 3. ^ 成田空港内の団結小屋、強制撤去に着手. Yomiuri Shimbun. 2011-08-06. ^ "Protester to sell land to Narita airport operator". Mainichi Japan. 5 May 2015. Archived from the original on 2015-05-07. Retrieved 7 May 2015. 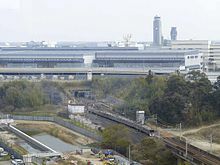 ^ Narita International Airport Corporation awards contracts for LCC terminal | CAPA. Centre for Aviation. Retrieved on 2013-12-01. ^ 地域振興. Narita Airport Authority. ^ 成田国際空港株式会社法. Narita International Airport Corporation. ^ "Narita Airport to get 3rd runway to meet demand, operate longer：The Asahi Shimbun". The Asahi Shimbun. Retrieved 2018-03-14. ^ a b c d Shimizu, Kaho (3 June 2006). "Narita South Wing open". The Japan Times. Retrieved 15 May 2015. ^ "DELTA AIR LINES WILL MOVE TO TERMINAL 1 AT NARITA AIRPORT". Delta Air Lines. Retrieved 15 May 2015. ^ a b c "Airport Guide: Airlines". Narita International Airport. Archived from the original on 13 May 2015. Retrieved 15 May 2015. ^ "British Airways' Narita Move Brings All Oneworld Airlines Together in T2". Airlines and Destinations. Retrieved 15 May 2015. ^ "Vanilla Air moves into the brand-new terminal at Tokyo Narita hub!". Vanilla Air : Airline Tickets, Cheap flights and Airfare - Tokyo-based LCC. 16 May 2016. ^ "Air Canada moves Calgary – Tokyo to seasonal service in 2018/19". RoutesOnline. 11 June 2018. Retrieved 11 June 2018. Air Canada operates... summer seasonal flights up to seven times a week between Calgary–Tokyo Narita. ^ "All Nippon Airways confirms Tokyo-Perth service". www.airlineratings.com. 26 December 2018. Retrieved 26 December 2018. ^ Austrian resumes Tokyo from May 2018 Routesonline. 6 July 2017. ^ News, ABS-CBN. "Cebu Pacific to launch direct flights between Clark and Narita, Japan starting August". ABS-CBN News. Retrieved 2 April 2019. ^ 2018, UBM (UK) Ltd. "Ethiopian Airlines East Asia routing changes from June 2018". ^ "Jeju Air adds Daegu – Tokyo service from late-Oct 2018". Routesonline. Retrieved 2018-11-02. ^ "Jeju Air adds Tokyo Narita – Guam route from late-Oct 2018". routesonline. Retrieved 30 August 2018. ^ "Jeju Air adds Muan – Tokyo service from late-March 2019". routesonline. Retrieved 21 February 2019. ^ "Jetstar Japan adds Kochi service from late-Dec 2018". routesonline. Retrieved 27 September 2018. ^ Jetstar Japan plans Miyazaki launch in Dec 2017 Routesonline. 21 September 2017. ^ "Jetstar Japan adds Nagasaki from Sep 2018". Routesonline. Retrieved 2018-11-02. ^ "Jetstar Japan adds Tokyo – Shimojishima route in S19". routesonline. Retrieved 16 November 2018. ^ Malaysia Airlines S18 international changes as of 12DEC17 Routesonline. 12 December 2017. ^ 唯一台中飛東京 華信航空6/14首航 [Only Taichung–Tokyo flight; Mandarin Airlines to operate flights from 14 June] (in Chinese). Central News Agency. 2018-04-02. ^ "NokScoot to start Tokyo flights in June". Bangkok post. Retrieved 23 April 2018. ^ "Royal Brunei adds Tokyo service from March 2019". Routesonline. Retrieved 2018-11-02. ^ Liu, Jim (14 November 2017). "S7 Airlines adds Irkutsk – Tokyo in S18". Routesonline. Retrieved 14 November 2017. ^ "Russia, Novosibirsk, Tolmachevo (OVB) <-> Japan, Tokyo, Narita (NRT)". S7.ru. S7 Airlines. Retrieved 5 October 2017. ^ Liu, Jim (8 October 2017). "S7 Airlines moves Novosibirsk – Tokyo launch to June 2018". Routesonline. Retrieved 9 October 2017. ^ "Spring Airlines Japan adds Tokyo – Ningbo service from late-April 2019". routesonline. Retrieved 11 April 2019. ^ "New Destination: Bangkok to Tokyo (Narita), Japan". Lionairthai.com. Retrieved 2018-11-02. ^ "T'Way Air adds Jeju – Tokyo service from Sep 2017". Routesonline]]. Retrieved 15 June 2017. ^ "Vietjet Air plans Hanoi – Tokyo Narita from Jan 2019". Routesonline. Retrieved 2018-11-02. ^ Liu, Jim (24 March 2017). "Yakutia adjusts planned Tokyo service in S17". Routesonline. Retrieved 24 March 2017. ^ a b 2018, UBM (UK) Ltd. "Cargolux plans new Tokyo / Seoul routing from late-March 2018". ^ "Edmonton adds to cargo load with a regular flight to Tokyo". ^ For 2003 to 2012: 暦年・年度別空港管理状況調書 (PDF). Ministry of Land, Infrastructure and Transport. Archived from the original (PDF) on 1 November 2013. Retrieved 1 April 2014. ^ a b "A Member of the Community". Narita Airport. 2000-09-10. Archived from the original on 2000-09-01. Retrieved 2019-01-07. ^ "Towards the Solution of Narita Airport Issues." Narita Airport. September 1, 2000. Retrieved on January 7, 2019. ^ "Corporate Profile." Nippon Cargo Airlines. Retrieved on February 17, 2012. "NARITA OFFICE NCA Line Maintenance Hangar Narita International Airport Narita-shi, Chiba 282-0011, Japan" and "TOKYO OFFICE: Onarimon Yusen Bldg. 11F 3-23-5 Nishi-Shimbashi Minato-ku, Tokyo 105-0003, Japan"
^ "Corporate Profile." Nippon Cargo Airlines. June 28, 2008. Retrieved on February 17, 2012. "NARITA OFFICE: Cargo Administration Bldg. 4F Narita International Airport Narita-shi, Chiba 282-0021, Japan"
^ 成田にカプセルホテル　空港会社、ＬＣＣ客らに照準. Nihon Keizai Shimbun. 24 April 2014. Retrieved 28 April 2014. ^ "Long-Awaited Pipeline." Narita Airport. September 1, 2000. Retrieved on January 7, 2019. ^ "mado_e.html." Narita Airport. September 1, 2000. Retrieved on January 7, 2019. Japanese version (page has black background but text can be selected for viewing). ^ "Community Consultation Center." Narita Airport. October 12, 2000. Retrieved on January 7, 2019. Japanese version (page has black background but text can be selected for viewing). ^ "Airport Information Center." Narita Airport. October 12, 2000. Retrieved on January 7, 2019. Japanese version (page has black background but text can be selected for viewing). ^ "Japan National Tourism Organization - Plan Your Trip - > Transportation - International Airport Access - Narita Airport (Tokyo)". ^ "Mori Building City Air Service". ^ "Travel Tips: How to Get From Narita Airport to Haneda Airport". USA Today. Retrieved 28 May 2012. ^ Radicals bomb airport offices, AP, March 15, 1987. ^ Aircraft Accident Investigation: United Airlines flight 826, Pacific Ocean, NTSB, December 28, 1997. ^ Bobby Fischer: ich bin ein Icelander!. March 21, 2005. ^ "Wind shear eyed in deadly crash of FedEx cargo jet". Archived from the original on 26 March 2009. Wikimedia Commons has media related to Narita International Airport. Wikivoyage has a travel guide for Tokyo Narita Airport. Nagata, Kazuaki (9 June 2009). "Narita airport — worth long struggle to build?". Japan Times. Retrieved 10 June 2009.